Begin september verblijft Hector Zamora (1974, Mexico City, Mexico) voor de derde maal in FLACC. Deze keer organiseert hij een picknick en plant een gerichte interventie op de terril, de mijnafvalberg van Winterslag. Vanuit de opzet van de picknick wil de kunstenaar in grote groep werken aan een tijdelijke landmark, het aanbrengen van een krachtig oriëntatiepunt in het landschap. Hij vertrekt hierbij vanuit het universele gegeven hoe mensen op een eenvoudige manier en met de aanwezige middelen een berg inzetten om te communiceren naar hun omgeving. Ter illustratie verzamelde de kunstenaar wereldwijd foto’s en satellietopnames van monumentale liefdesverklaringen, politieke boodschappen en middenstandinformatie gekalkt of aangebracht met stenen. Dit voorjaar vond hij ook in Genk ‘Delly ‘, opgebouwd uit de aanwezige stenen van een voormalig fietspad op de berg. Deze stenen vormen nu ook het basismateriaal van de ingreep. De terril van Winterslag vormt het hoogste en meest zichtbare punt van de stad en sluit aan bij C-Mine, het recente herbestemmingplan van het mijnterrein als site voor cultuur, toerisme en creatieve economie. Samen met de aanwezigen bepaalt Zamora tijdens de picknick vorm en inhoud van de ingreep en voert die meteen ook uit. Dit werk zet zich niet in een traditie van land art maar wil een publieke happening zijn, een spel, een uiting van graffiti, over vrijheid en de impact van een berg met boodschap. Het wil bovenal een katalysator zijn dat ook mensen in de toekomst, los van haar ontstaanscontext, aanzet tot het schrijven en tekenen op de berg vanuit de aanwezige setting. De interventie wordt minutieus en vanuit uiteenlopende perspectieven geregistreerd. Steven Op de Beeck neemt in oktober afscheid van FLACC en start als directeur van Contour Mechelen vzw. FLACC zoekt voor haar werking een nieuwe artistiek coördinator. Het takenpakket omvat het ontwikkelen en opvolgen van werkplaatsprojecten binnen het bestaande artistiek beleidsplan. Hij of zij zorgt voor de coördinatie van de selectieprocedures van kunstenaars en begeleiding van het productieteam atelierwerking. De artistiek coördinator ontwikkelt een presentatie- en publiekswerking en zorgt voor het opstellen en opvolgen van subsidiedossiers in samenspraak met de zakelijke leiding. Wij verwachten van de kandidaat een passende culturele of artistieke opleiding en een relevante ervaring in het werkveld beeldende kunsten. Je hebt kennis van de internationale kunstwereld, bent goed in het uitbouwen en onderhouden van netwerken en een communicatief sterke teamspeler. Om te solliciteren mail je jouw motivatie en curriculum naar flacc@skynet.be ter attentie van Ludo Thys voor 1 oktober. In samenwerking met de dienst Cultuur van de stad Genk en in het kader van het project ‘Sterk Water’ maakt fotograaf Jan Kempenaers momenteel gebruik van de digitale studio. Het project omvat een workshop met de studenten fotografie van de Genkse Media and Design Academie en resulteert in een tentoonstelling die plaatsvindt in de Stedelijke Bibliotheek, het Cultuurcentrum en het Emile Van Dorenmuseum van 17 september tot 2 november 2008. Verder werd ook een werk van Geert Goiris voorbereid voor het film- en fotografiefestival Images'08 van Vevey. Deze e-mail werd verzonden door flacc@skynet.be De e-mailadressen worden enkel en alleen gebruikt om u op de hoogte te houden van onze activiteiten en worden niet verder verspreid. Indien u in de toekomst geen informatie meer wenst te ontvangen van FLACC, gelieve deze mail te beantwoorden. In September the shooting of a 16mm film by Rä di Martino (1975, Rome, Italy) starts at FLACC. 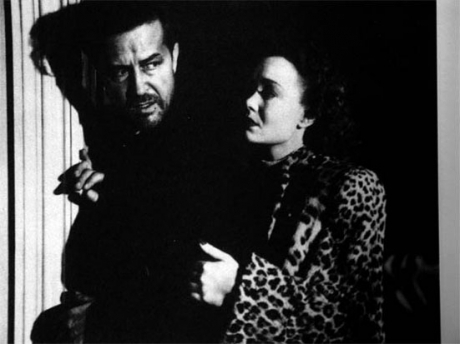 The movie ‘Singing the news' (working title), is conceived as a tableau vivant based on a scene from Billy Wilder’s classic 'The Lost Weekend' (1945). After a characteristic cinematographic opening scene the actors start singing that shooting day’s news, announcing the date as well. The news bulletin is shortened, but the structure is kept and turned into a canon, which will be composed by Mauro Remiddi. The first voice starts to sing and thereupon the melody is successively taken over by the other voice. Di Martino is supported by the expertise of Allessandro Chiodo as director of photography and the actress Maya Sansa. With her film and video work the artist moves in the borderland of our personal and collective memories. She analyses how media and literature are subconsciously and permanently influencing our existence and are changing it into a fictitious story line. Di Martino's technically sophisticated films are also a specific critique of film history as a prominent art form. Recently, work by Rä Di Martino was shown in the Monitor Gallery (Rome), Tate Modern (London) and PS1 (New York). At the moment her movie ‘The Dancing Kid’ can be seen at Manifesta 7 in Rovereto. The artist is also creating a new publication in the series ‘Works that could be mine & works that I would like to be mine’, together with the artists that will be invited by FLACC this year. There will be a film programme by Rä di Martino in FLACC on Saturday 13 September at 20.00 hours. By screening an overview of a dozen films, Rä di Martino will personally illuminate her work. In the beginning of September Hector Zamora (1974, Mexico City, Mexico) will reside in FLACC for the third time. This time he will organise a picnic and an intervention on the 'terril', the Winterslag slag heap. With this idea of a picnic the artist wants to create, with a large group of people, a temporary landmark, a powerful point of orientation in the landscape. Key to this project is the universal fact of how people in a simple way and with the means available use a mountain to communicate with their surroundings. To illustrate this the artist collected photos and satellite images from all over the world, of monumental declarations of love, of political messages and retail advertising, painted or laid in stones. In Genk, this spring, he also found 'Delly', built from the stones taken from what had been a cycle track on the mountain. These stones will be the basic material for the intervention too. The Winterslag slag heap is the highest and most visible landmark in the city, and is situated near C-Mine, the recent redevelopment project for the mine as a site for culture, tourism and creative economics. During the picnic, and together with those present, Zamora will decide the form and contents of the intervention which will be carried out straightaway. 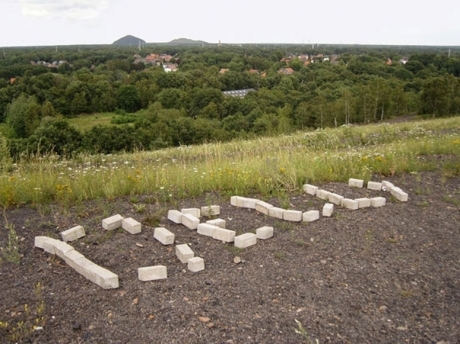 This work does not fit in a tradition of land art, but is intended as a public happening, a play, an expression of graffiti. It is about freedom and the impact of a mountain with a message. The project aims to be a catalyst which, also in future, will prompt people to write and draw on the mountain, starting from the present setting. The intervention will be recorded meticulously and from different perspectives. Those who want to join this project will meet in FLACC and will then be brought to the foot of the Winterslag terril. From there, everybody will walk to the top of the hill, for a picnic and the final intervention. Please confirm your presence beforehand at flacc@skynet.be. In October Steven Op de Beeck will leave FLACC to become director of Contour Mechelen vzw. FLACC is therefore looking for a new artistic coordinator. The job responsibilities comprise the development and follow-up of workplace projects within the existing artistic policy plan. He or she will be responsible for the coordination of the selection procedures for artists and will also support the workshop production team. The artistic coordinator will develop presentational and public activities and will be responsible for the creation and follow-up of subsidy files in consultation with business management. We expect the candidate to have a suitable cultural or artistic training and relevant experience in the field of the visual arts. You have knowledge of the international art world, are communicative, an excellent networker and a strong team player. Please mail your motivation and CV to flacc@skynet.be attn. Ludo Thys before 1 October. In collaboration with the department of Culture of the city of Genk, within the framework of the project ‘Sterk Water’ the photographer Jan Kempenaers is using the Flacc digital studio at the moment. The project consists of a workshop with the photography students of the Genk Media and Design Academy and will result in an exhibition taking place in the Stedelijke Bibliotheek, the Cultuurcentrum and the Emile Van Dorenmuseum from 17 September to 2 November 2008. Furthermore a work by Geert Goiris was prepared for the film and photography festival Images '08 at Vevey. This mail was sent by flacc@skynet.be. Your personal data are only used to inform you about the activities of FLACC. If you don't want to recieve information from FLACC anymore, please reply to this e-mail.